When I went to the Royal Winter Fair this year, one of the reasons was to see the Sheep to Shawl – each team gets a raw fleece, and they spin and weave it into a shawl in four hours. The finished shawls are judged and then auctioned off in the fleece auction. I’ve got one aunt who just LOVES handknit gifts, but sadly this year I don’t really have to make her something! So I decided to buy a shawl for her. The shawl I bought was made by the Etobicoke guild, and funnily enough, she lives in Etobicoke. So it’s pretty fitting, or something. 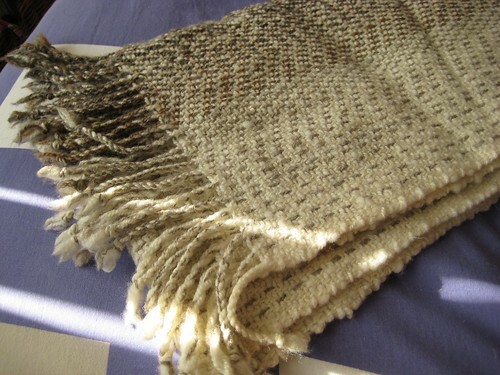 It’s woven with a colour progression along the width – it’s really cool. Of course, since the wool is not washed before spinning and weaving, it’s got all the straight-from-the-sheep goodness – lots of dirt and grime and lanolin. It’s a bit of a surprise to see how it washes up – you know it’s going to be good! I washed the shawl the next day in hot water and Palmolive twice, a couple rinses, and a final soak with Eucalan. Before: Pretty, but a bit stiff, definitely lanolin-y. After: the light parts are actually white, the fabric is soft and cushy and cohesive, everything’s plumped up. There’s less colour variation, because some of that which was woven in was actually differences due to dirt! It might be hard to tell from those photos. Let’s try a closeup. Yep, they’re really from the same section of the shawl! It’s beautiful. I’m planning on needle felting or embroidering my aunt’s initials on one end, to make it more personalized – and, well, maybe I’ll knit her some socks too. 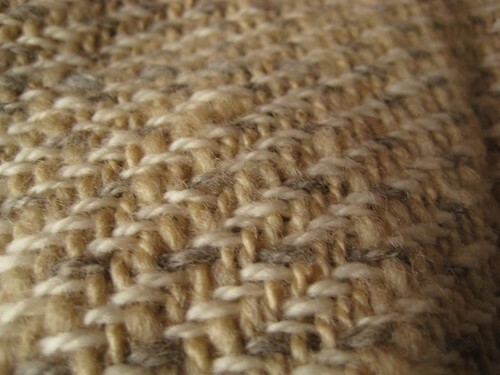 This just really clinches the desire to weave; I’ve got a rigid heddle loom but just haven’t really gotten into it yet. I think it’s the whole setup that’s kind of intimidating – with knitting, I just sit down and start. 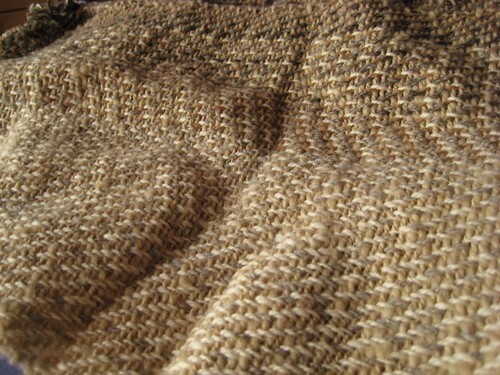 With weaving, there’s all the planning and the time spent warping and such…maybe over Christmas I can get going on that. In the meantime…back to work! 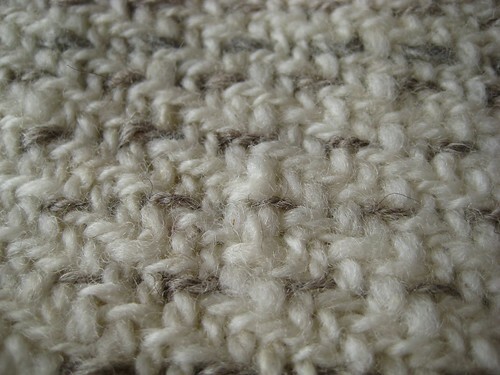 This is my handspun Romney knit up – I love it! 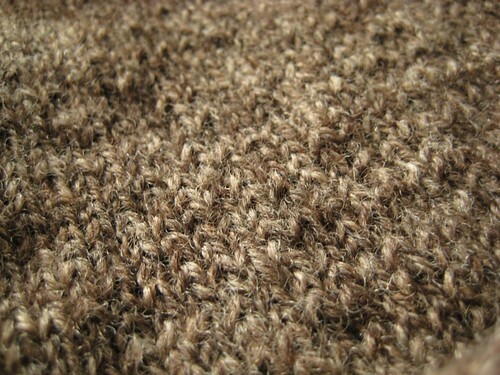 It’s a nice light, cohesive fabric with a pleasant woolyness. And actually fairly consistent too. Now, if only I could scare up the time to work on it! P.S. No newsletter yet, but we’ve got Socks that Rock at lettuce knit – have at it! In the meanwhile, I’m trying very hard to stay on track with stuff that I need to get done, but I must say that the urge to cast on something new is overwhelming – even though I did cast on something new just yesterday! So, instead of actual progress, how about a current (as in, they still hold my interest) WIP roundup. – Noro blanket. Xmas present. 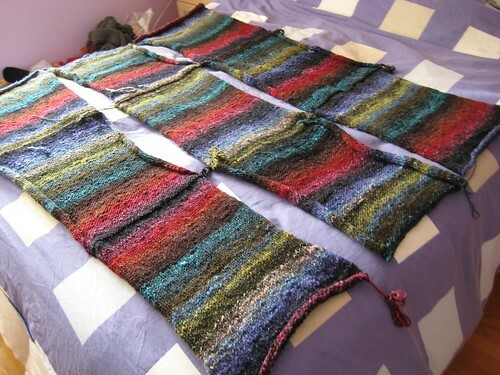 The panels are all done – they were certainly fast knitting! They’re shown on a double bed, so the blanket’s going to be pretty sizeable once I put the borders in. I’m going to crochet in some black alpaca between the panels and around the whole thing. – Xmas presents #1, #2, and #3 – Well. #1 is started. 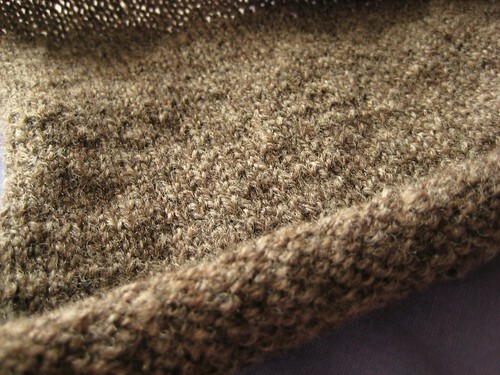 Nothing else has been, but I’m hoping one of the other ones that I’ve been planning (a shawl) goes really fast. We’ll see – that’s one I want to cast on for right now! 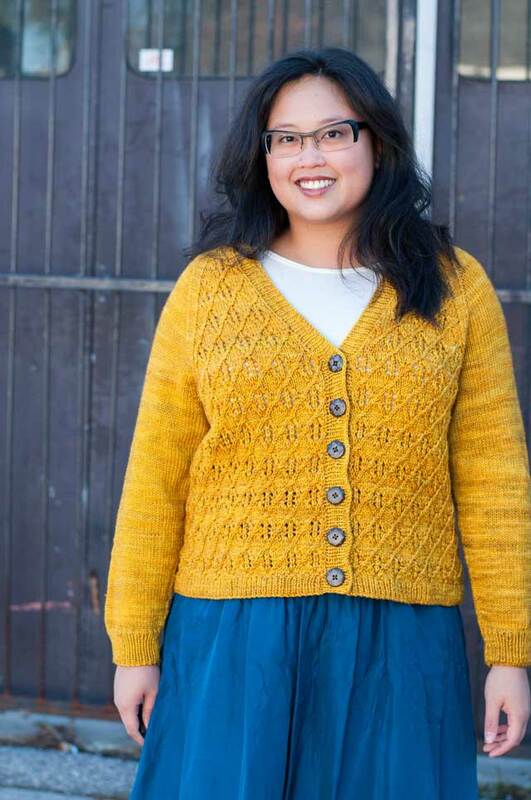 – Treeline Stripe sweater – I love love love this sweater and really want it to be done so I can wear it! Alas, haven’t really done anything with it lately. The body is done to the underarm and one sleeve is done to the underarm. Everything’s being overshadowed by a secret project that needs to be done for the end of the month. Which is getting there, now that I’m feeling the crunch (even more) and really trying to knit faster. Projects I’m tempted by? A cabled sweater based on one Alexis was wearing last week; the Gathered Pullover from the latest Interweave; colourwork mittens; some sort of new winter headgear.